It seems like a day doesn't go by without some darling game or another being announced or released onto the Nintendo Switch. Just today, Ninja Theory's brilliant Hellblade found its way to the console. 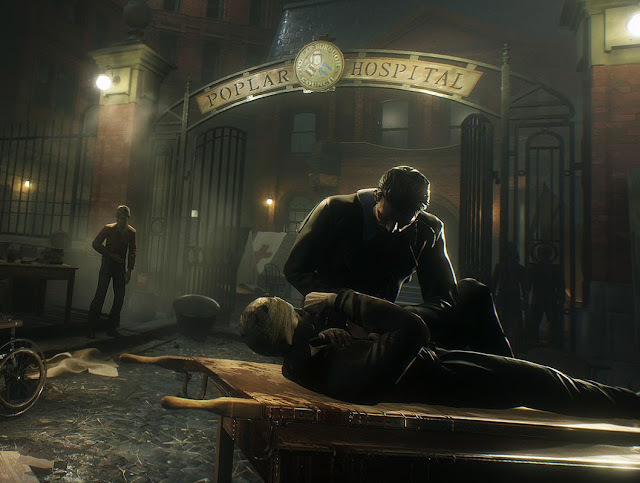 Soon enough you'll be able to play two other excellent games that we were quite enamoured with on their console releases, too: Focus Home Entertainment has announced Switch ports of both Vampyr and Call of Cthulhu. Vampyr comes to us from Dontnod Entertainment, and while this dark action RPG didn't go down quite as well as the Life is Strange series has, it is nonetheless a superb example of video game storytelling. Check out our review and look forward to playing this on the go in October. Call of Cthulhu, meanwhile, is a horror-themed RPG that's more about investigation and detection than it is combat. Going all-in with H.P Lovecraft's visions for cosmic horrors and dark cults that would sooner send you insane than just dead, Call of Cthulhu is one of the rare examples of a video game that does the great author's vision justice. Here's our review of that one. It also releases in October. Yay! More papercraft games! We do like these! But I digress. I'm here to introduce you to Paper Beast, the newest project from the artist behind the classic, Another World. It's an exploration-themed game where you play as - you guessed it - a beast made of paper, in a vast world with a teeming papercraft ecosystem. It's going to be released on PlayStation VR first (this year), followed by a non-VR version later on (in 2020). From the announcement: More than anything, Paper Beast is a virtual journey leading quirky animals through a colorful universe that sprouts from the remnants of the internet. We will tell you a story, but the narration is unspoken. Through the events of the world, their pacing, the story unfolds. Much like Another World, there is no text or dialogue. There is only the environment, and you will feel immediately connected to it. Our physics system enriches the experience through simple interaction and manipulation of the environment. That sounds downright brilliant to me. Darkest Dungeon is one of the most noteworthy RPGs to have been released over the past decade, for its dark themes, exquisite storytelling, and brutal difficulty - even by roguelike standards. This is a game that was ultimately rewarding for a lot of people, but getting there was hard work. It's not surprising that that kind of game would inspire copycats, which is what Vambrace: Cold Soul looks like it could be. Trading the dark, gothic atmosphere of Darkest Dungeon for a harsh, frozen one, the action looks like it will flow in much the same way, and the visual aesthetic looks to be very heavily inspired by the predecessor. From the press release: The King of Shades has cursed the great city of Icenaire. Now cast under a permanent blight of frost fall, its former residents have returned from the dead as mad Wraiths. Survivors take refuge deep underground where they lead a desperate campaign against this unearthly power. Woefully outmatched, they are forced into hiding as the King of Shades amasses an army of the undead above them. One fateful day, a mysterious stranger appears in the city with an enchanted vambrace. This game lands on PC on My 25, and console versions (PlayStation 4, Xbox One and Switch) to come in Q3, 2019. It looks like SNK is going to do the same thing that Mortal Kombat did, and release trailers for each individual character as the company ramps up to the full release of Samurai Shodown. But, given the very first trailer is of the best character in the series anyway, I'm not sure what point there will be to watch any of the others. Nakoruru has long been a favourite of this particular series. A young fighter that uses a falcon to help her with her attacks, Nakoruru has plenty of airborne game, and backs that up with a lot of skill with her short sword. Nakoruru is there for people who like light, fast, and technical fighters. She won't be the hardest hitting in the Samurai Shodown roster, but if you can master her deflects, parries, and swift strikes, she may well be the most deadly of them all.